Kersten Cattle, raising registered Simmental, Maine-Anjou cattle that work in all aspects. 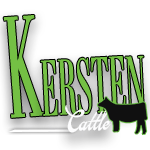 Kersten Cattle Company is a small family operation outside of Gretna, NE. They raise primarily Simmental and Maine-Anjou cattle, but do include a few other breeds in their herd. Their goal is to continue to breed and raise cattle that do well in producing high quality offspring, as well as, cattle that do well in the feedlot and sale ring. Please feel free to contact them for more information about anything you see or read on this website. They want to hear from their valued friends and customers. Thank-you! Latest news from Kersten Cattle!